This Cucumber Tomato Salad is about to become a favorite spring and summer staple with its medley of bright flavors and textures in every bite! 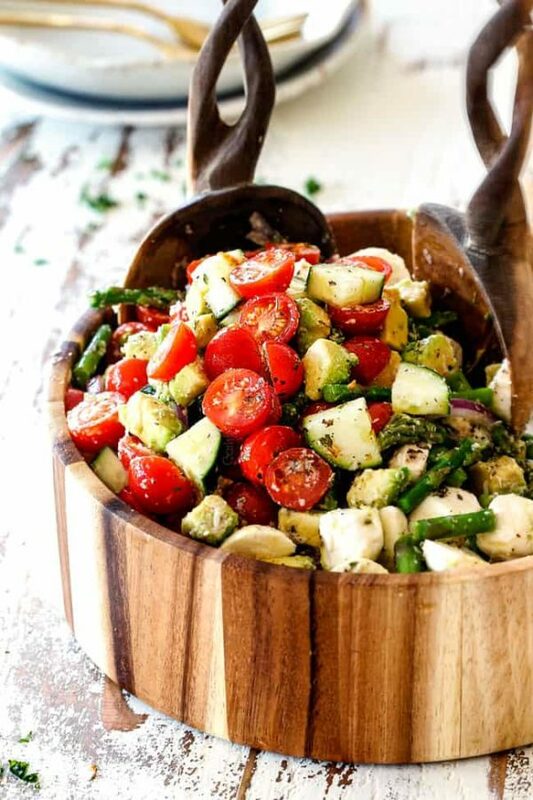 This Cucumber Tomato Salad is bursting with crisp cucumbers, juicy tomatoes, crunchy asparagus, creamy avocados, tangy red onions, and melt-in-your-mouth mozzarella drizzled with tangy Italian Dressing for the ultimate quick, refreshingly delicious spring and summer salad! It makes the ideal make-ahead side that goes with practically everything and there are endless ways to customize it from the veggies to the cheese to the dressing to suit your tastes and what you have on hand. I am so excited for salad season and not only salad season but everything tomato, cucumber and asparagus! I’ve bundled up my favorite fresh veggies into this Cucumber and Tomato Salad and it is can’t-stop-eating deeeelicious! This Cucumber Tomato Salad is the perfect light yet vibrant, fresh side dish for dinner, potlucks or for feeding a crowd. It goes well with practically everything from pizza and burgers to fish, chicken and steak. The contrasting crunch of the cucumbers, asparagus and tomatoes with the creamy bites of mozzarella (my fav!) and avocado is what foodie dreams are made of. I’ve scaled down my favorite Italian Dressing (used in my upcoming Italian Pasta Salad) to infuse the Cucumber Tomato Onion Salad with just the right amount of complex tang through and through. 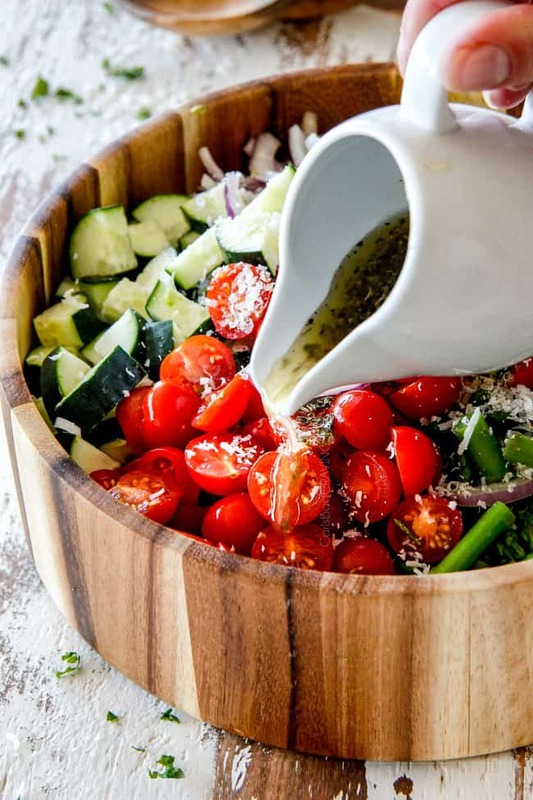 It’s super simple to whisk together but you could also use your favorite store-bought Italian Dressing or vinaigrette- just promise you’ll make this Cucumber and Tomato Salad – mmm, k?! What Cucumber Should I use in Cucumber and Tomato Salad? This might seem like a silly question – a cucumber is a cucumber, right? But did you know there are almost 100 varieties of cucumbers grown in the world? The most common grocery store varieties are the regular slicer cucumber, pickling cucumbers and English cucumbers. For our Cucumber Tomato Salad Recipe, we want English cucumbers. English cucumbers, sometimes called seedless cucumbers, are longer and more narrow than slicing cucumbers. What makes English cucumbers ideal for salads is they are often wrapped in plastic instead of waxed so you can eat their skin. Their skin is also thinner and not bitter like slicing cucumbers. Their seeds are much smaller and easier to eat and they have a more mild, almost sweet taste in general. If you cannot find English cucumbers, you are more than welcome to use common slicing cucumbers but I recommend removing the bitter, thick skin. What Tomatoes are best in Tomato Cucumber Salad? As far as tomatoes go, it comes down to personal preference and what you have growing in your garden. I highly prefer cherry tomatoes in our Cucumber Tomato Salad for a few reasons. They are predictably sweeter than grape or large tomatoes, they are less watery but still juicy, they hold their shape and you don’t get tomato “pulp” that likes to fall apart. How long will this Cucumber Tomato Onion Salad Keep? This Cucumber Tomato Salad tastes WAY better chilled in order for the flavors to meld and the ingredients to become cool and crisp. I recommend at least 30 minutes. If you are running low on time then place your salad in the freezer for up to 20 minutes and then return it to the refrigerator. This Cucumber and Tomato Salad is best served within the first 12 hours but will keep in the refrigerator for up to 48 hours, the cucumbers will just loose some of their crispness. I like to slice my cucumber thick so they stay crunchier. Whenever you serve your salad, whether within 30 minutes or 48, you will need to give it a stir because the dressing does not contain an emulsifying agent and will separate – nothing that a little stir can’t solve. If you aren’t eating all of your Cucumber Tomato Salad when served, then only add avocado to portion(s) that are being eaten because the avocado will brown if not eaten right away. As previously mentioned, you can subsite English cucumber with a slicing cucumber but be sure to peel the slicing cucumber because the skin is thicker and more bitter. Slice your cucumbers thicker for extra crunch. If don’t want to spend $$ on mozzarella balls, you can use mozzarella chunks or even Monterey Jack or feta if that’s what you have on hand. Mozzarella balls are often called mozzarella snacking balls and can be found with the specialty cheeses. Try adding fresh sweet corn on the cob – make sure you leave it raw. I wish I would have thought of this before I made the salad – I would definitely add fresh corn next time. Add red bell peppers or any of your favorite veggies! You can customize the dressing by replacing the red wine vinegar and lemon juice with balsamic to taste. 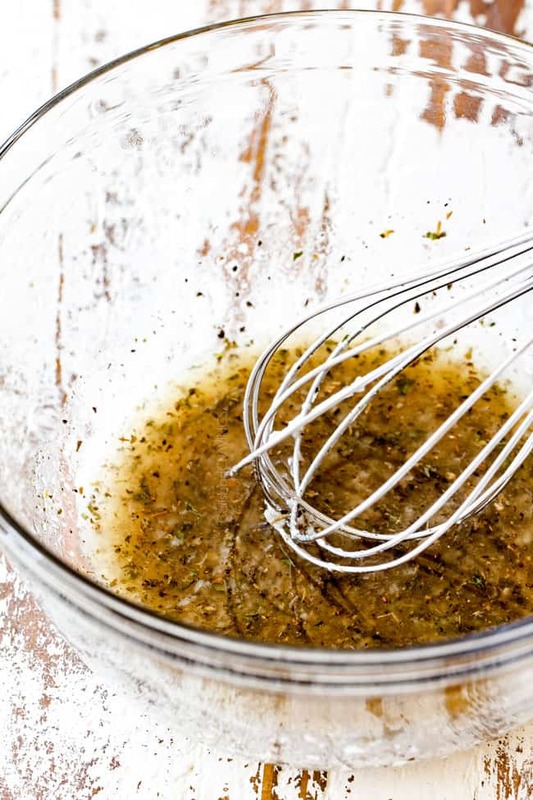 Feel free to use store-bought quality Italian Dressing, or your favorite store-bought vinaigrette, you’ll need about 1/3 cup. 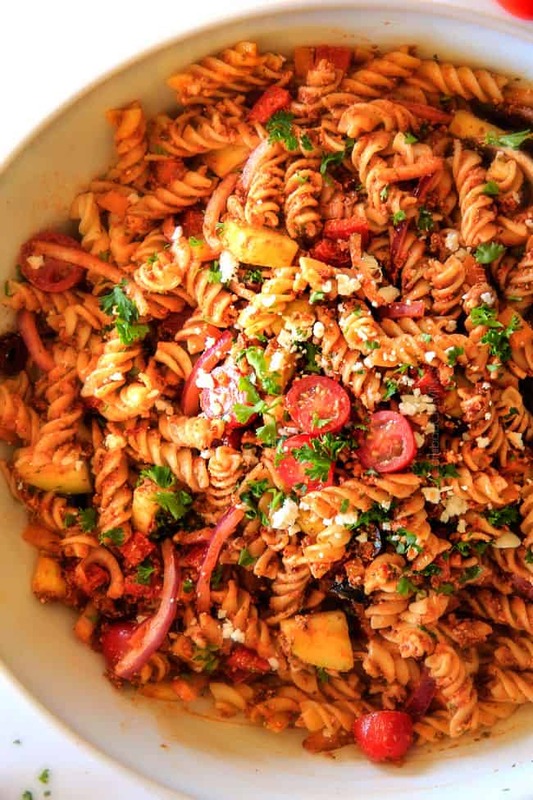 Turn this Tomato Cucumber Salad into an orzo pasta salad and 1 ½ x the dressing. CHILL your Cucumber and Tomato Salad – it tastes WAY better once the flavors have melded and everything is crisp and cool. If you are short on time, stick your salad in the freezer for 20 minutes then in the refrigerator until time to serve. As previously mentioned, only add avocados to the salad you are eating immediately because they will turn brown when stored. 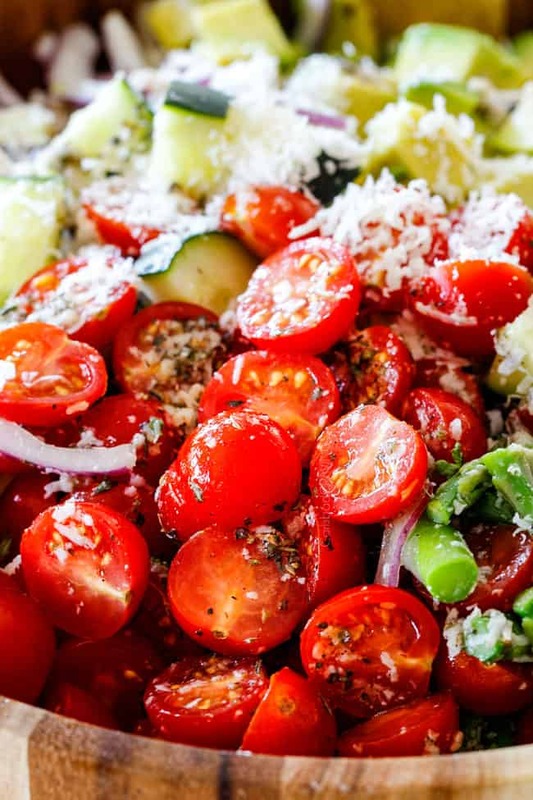 Want to try this Cucumber and Tomato Salad Recipe? 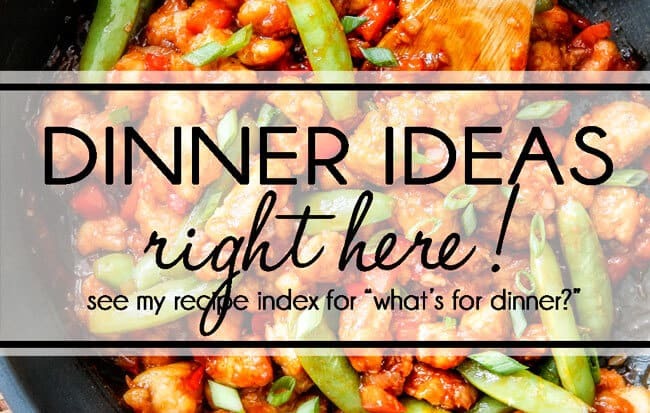 Pin it to your SIDE, SALAD or VEGETABLES Board to save for later! 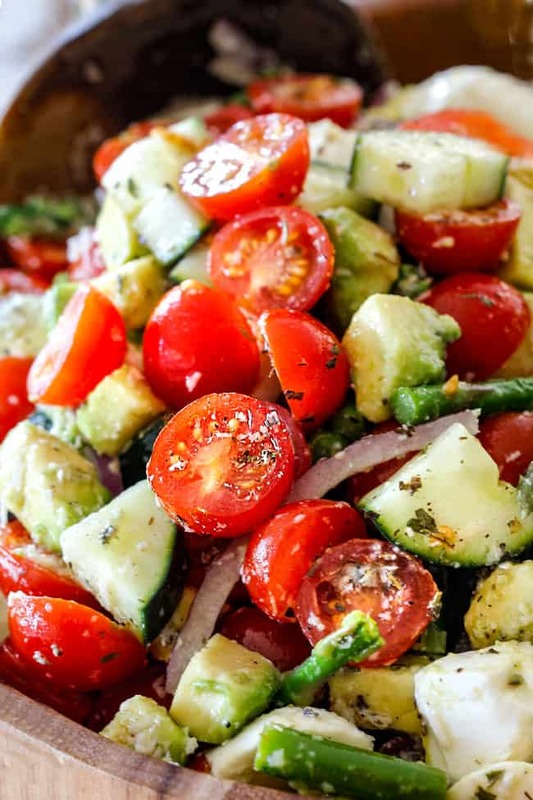 This Cucumber Tomato Salad is about to become a favorite spring and summer staple with its medley of bright flavors and textures in every bite! 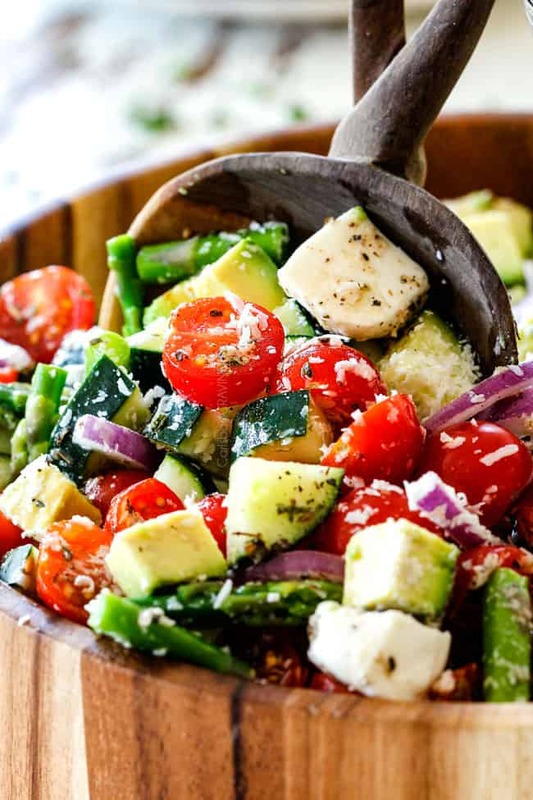 It's bursting with crisp cucumbers, juicy tomatoes, crunchy asparagus, creamy avocados, tangy red onions, and melt-in-your-mouth mozzarella drizzled with tangy Italian Dressing for the ultimate quick, refreshingly delicious spring and summer salad! 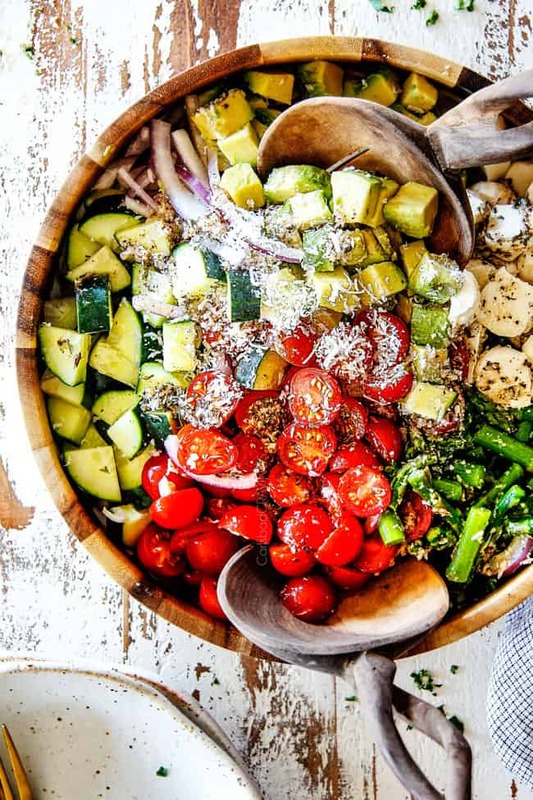 It makes the ideal make-ahead side that goes with practically everything and there are endless ways to customize it from the veggies to the cheese to the dressing to suit your tastes and what you have on hand. 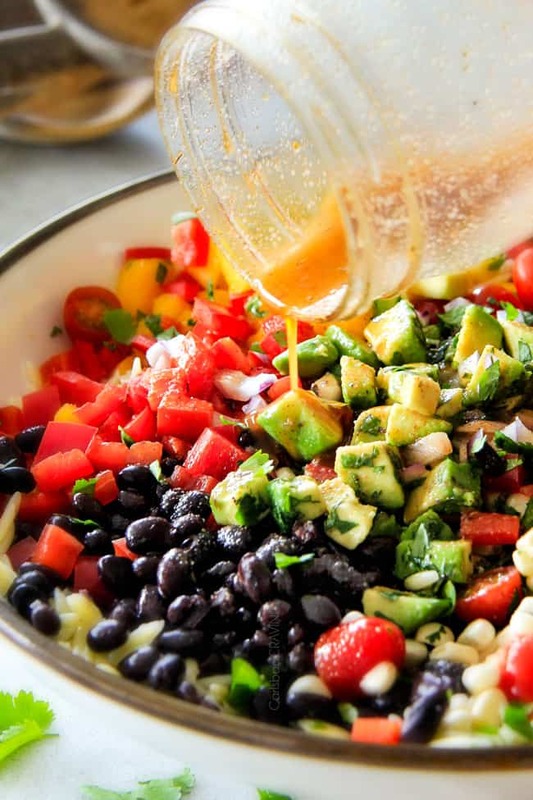 Combine all the Dressing ingredients in medium bowl and whisk to combine. Set aside then whisk again before using. Boil asparagus in a large pot of water for 2 minutes. Drain and rinse with cold water. 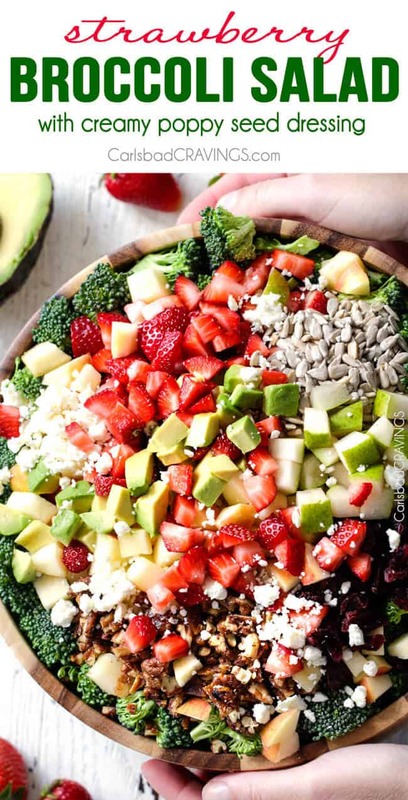 Add all of the salad ingredients to a large bowl EXCEPT avocados, drizzle with salad dressing and toss to combine. Cover with plastic wrap and chill at least 30 minutes. Add chopped avocado right before serving and gently stir to combine. If you aren’t eating all of your Cucumber Tomato Salad immediately, then only add avocado to portion(s) that are being eaten because the avocado will brown. This salad is best served within 12 hours but will keep in the refrigerator for up to 48 hours, the cucumbers just won’t be as crisp. Whenever you serve your salad, whether within 30 minutes or 48, you will need to give the Salad a stir because the dressing does not contain an emulsifying agent and will separate. *You can subsite English cucumber with a slicing cucumber but be sure to peel the slicing cucumber because the skin is thicker and more bitter. 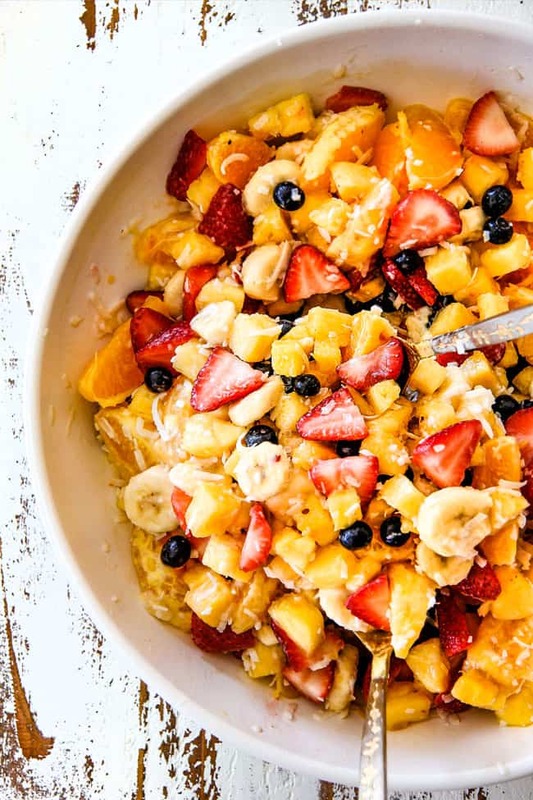 Looking for more Spring and Summer Recipes? This salad is so refreshingly tasty! Crunchy and colorful with just the right amount of tangy. This is the perfect salad to bring to a potluck or picnic gathering. I left out the cheeses due to dietary restrictions and also the avocado since I made this in advance of a gathering. I added corn as suggested which made this a bright and colorful salad. My whole family loves this one :)!! Awesome Maryann, I’m thrilled it was a hit and I’m so happy you added the corn! Thank you for taking the time to comment!